Pioneer Solutions, a leading provider of commodity trading and risk management solutions, announced today that it will join the 9th Energy Trading Operations & Technology Summit (ETOT) as a sponsor on 7-9 November in London. 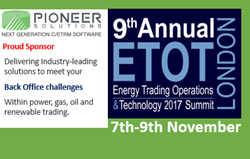 ETOT is a focused event empowering 180+ energy back office and IT professionals to discuss best practices and ways of overcoming, as an industry, the most pressing challenges around operational and technology issues. Spread over two days of presentations, panel discussions and case studies, this year’s edition of ETOT focuses on Energy Trading Transformation, Back Office, and Technology. ETOT will be bringing together expert practitioners from leading energy trading companies, to share best practices and insights.